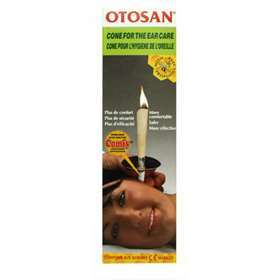 The Otosan cone benefits ear hygiene in a simple, safe and effective way, as it is a natural system which comes from an ancient popular tradition. Clinical research research has shown the effectiveness of the Otosan cone in maintaining ear hygiene for adults and children alike. Used regularly it helps to prevent the annoying ailments caused by a lack of hygiene, which if disregarded, may damage the ear's long term health. Helps remove and prevent wax build up. Eliminates residual water in the ear canal after swimming. 1. Insert the narrower part of the ear cone one centimetre into the Comfy applicator. 2. Insert the ear cone into the protective disc (with the silver part facing upwards) until beneath the flame-breaking ring. Light the wider end of the ear cone. 3. Rest your head on a table and insert the ear cone with the Comfy applicator over your outer ear, keeping it in a vertical position. 4. When the flame has burnt down the ear cone to the Flame-breaking ring, take it out of the ear and extinguish it in a glass of water. 5. Repeat the treatment in the other ear. White vapour may come out from the lower part of the cone. This is a normal effect. Cotton, Paraffin Wax, Beeswax, Propolis, Vegetable Stearin.